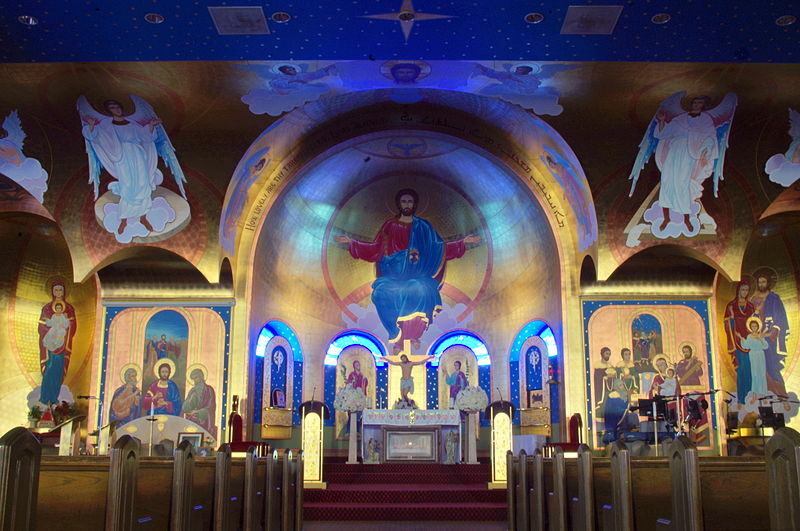 The 4th installment of my series on the Eastern Catholic Churches is up, this time on the Chaldean Rite, which includes the Chaldean Catholic Church and the Syro-Malabar Catholic Church. I was able to visit the St. Thomas Syro-Malabar Catholic Cathedral a year or so ago. It was a beautiful church with a beautiful liturgy. You can check out the full article over on Catholic365, but here's a preview of it below. We will delve a little more into the traditions, liturgical structures, and great saints of these two Churches in this essay so as to bring us as Latin Catholics into a better familiarity with our Eastern Catholic brethren. Tradition holds that the ancient Assyrian Church, in the lands that made up Mesopotamia, was founded by St. Thomas the Apostle and his disciple St. Thaddeus (or Addai) of Edessa. During the fifth century, the first major schism to seriously rock the universal Catholic Church occurred when these Assyrian Christians declared in 424 that their patriarch was no longer subject to the Pope in Rome. Also, in direct opposition to the teachings promulgated at the third Ecumenical Council of Ephesus in 431, the Assyrian Church rejected the Christological definitions that deemed Nestorius’ teachings on the nature of Christ’s divinity heretical. This effectively cut the Assyrian Christians off from the rest of the Christianity, both Rome and Byzantium, and with this schism we see the beginning of the current day Assyrian Church of the East. This Church’s orders and sacraments are still considered valid by the Catholic Church. However, it wasn’t until the 16th century that some bishops and priests would seek reunion with Rome. In 1552, a group of Assyrian bishops decided to return to the Catholic Church. This was in part instigated by the fact that the patriarchal succession within the Assyrian Church of the East was hereditary. Usually, the nephew of the patriarch was appointed, and this led to several patriarchs who were unfit for the job, or too young. In this case, the patriarch at the time had appointed his 12 year old nephew as his successor. After the nephew died, his 15 year old brother was appointed. For these and other reasons, a group of clergy rebelled and elected a monk named Sulaka as patriarch. However, none of these bishops who rebelled against the patriarch were metropolitans, and thus had no one to consecrate Sulaka. It seemed the group had reached an impasse until they traveled to the Holy Land where the Franciscans were already working with other Nestorians. Sulaka and his group talked with the Franciscans about having the Pope ordain and consecrate Sulaka as bishop and patriarch, and after sufficiently convincing the Franciscans that they were willing to submit to the Catholic Church in matters of doctrine and authority, the Franciscan friars gave them a letter of presentation to the Pope, and with a translator in tow, Sulaka and his compatriots headed for Rome. In 1553, Sulaka petitioned Pope Julius III to consecrate him as patriarch, and on February 20th, he made a profession of faith in front of the Pope. A couple months later, on April 9, 1553, he was consecrated as bishop in St. Peter’s Basilica, and was named Patriarch of the Chaldeans. Sulaka took the name of Shimun VIII Yohannan Sulaka. The newly installed patriarch of the Chaldean Catholic Church returned home in November and fixed his seat in the city of Amid. Less than two years later, he was put to death after being tortured by those belonging to the Assyrian Church of the East, but not before consecrating five bishops and elevating them to the rank of metropolitan so that the new line of patriarchs could continue. Over the next few hundred years, there was much fighting that occurred in the area as a result of the schism, and the patriarchate of the Chaldean Catholics went under many changes and divisions itself. It wasn’t until 1830 when two of the patriarchates which both professed the Catholic faith were consolidated into one and the new patriarch, Yohannan VIII Hormizd, was given the title of “Patriarch of Babylon of the Chaldeans”, a title still used by the patriarch to this day. The Chaldean Catholic Church is known as one of six Eastern Catholic Churches to be called a patriarchal Church.